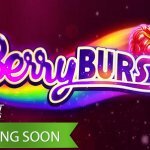 Netent Casinos » Maria Casino’s €10,000 Starburst™ Slot Tournament not to be missed! 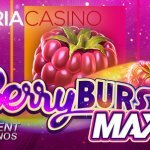 Maria Casino’s €10,000 Starburst™ Slot Tournament not to be missed! It’s one of the most popular video slots ever created and it’s the favourite of millions of players! I always guessed that it’s the simplicity of the game that attracts, and of course the famous Starburst™ star which expands all of the reels. 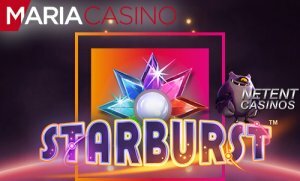 Whatever it is that makes this game popular, I’m sure players at Maria Casino will love it just a bit more the next 10 days thanks to the €10,000 Starburst™ Slot Tournament! What’s so special about the Starburst™ slot? When the Starburst™ slot was launched at the beginning of 2012, I wasn’t jumping off my chair out of enthusiasm! 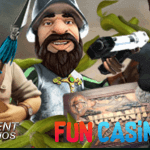 Instead, I was wondering how NetEnt could bring such a simple game to the NetEnt Casinos, with only one real slot feature available. But, what do I know about video slots after all? Well, back then, maybe not so much, because, in the end, this simple video slot became one of the most popular slot games ever! Until today, no video slot ever manage to become this popular and I blame that same simplicity of which I thought it was going to leave this game in the corner of hardly noticed games. The only aspect I saw that could make this game survive, was the fact it had a lot in common with the famous gem game Bejeweled. Both enriched with sparkling jewels, the Starburst™ slot showed some sort of gem game with its combo’s and super combo’s. But looking back, I don’t think this aspect did the job. I think it was that one slot feature available, the one with that colourful star that every NetEnt fan will recognise out of a hundred stars! The star that totally made the Starburst™ slot to what it is today as part of the expanding Starburst™ Wild. The traditional Wilds will be replaced with the innovative Starburst™ Wild, expanding over the entire reel and remaining in place for up to 3 Re-spins. It’s because of this slot feature that the Starburst™ slot offers the possibility to end up winning huge. The Starburst™ Wilds are astronomical, no matter how simple the game is with just one slot feature and a Both Way Win function! 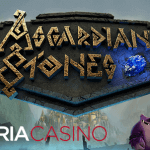 Now you know why this particular slot is so special and why you can’t leave this slot tournament unnoticed, but how do you create a chance to win a share of that amazing €10,000 prize pool? Let’s start at the beginning. 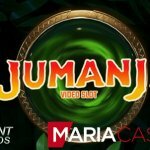 Because the first thing you need to be sure of is that you have an account at Maria Casino. If this isn’t the case, make sure you create one as there’s no chance you’re going to join this tournament without. Besides, it doesn’t take too long to register. Make sure you have real money in your account. That means you either play with the money you deposited before or you make a new deposit. Only spins equivalent to €0.10 or more will be accepted as a qualifying spin. Before you start to enjoy the Starburst™ slot experience, experiencing the thrill of a video slot tournament, you need to opt-in. Opt-in is required for the tournament and those who didn’t opt-in, won’t have a chance of winning up to €2,500 in cash. If you have an account, real money in your account, and you’ve opted in, it’s time to play the Starburst™ video slot with spins worth at least €0.09. 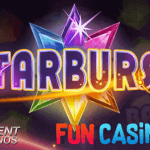 This is where the real fun starts and all you have to do is to play Starburst™ at Maria Casino between now and 12th September 23:59 (CET). That means you have until next week Wednesday to play at least 1 round which is required to qualify for the Starburst™ slot tournament. Of course, you can play as many spins on the Starburst™ slot as you want, simply because the more you play, the bigger the chance of winning a cash prize at the end of the slot tournament. The reason why is because the top 100 players with the highest equalized win over 1 consecutive round will win a share of €10,000 cash. The more rounds, the higher the chance of being among those 100 players unless your one spin on the Starburst™ slot was a very good one. However, it then still depends on the competition and if there are 100 players with a higher equalized win over 1 consecutive round, you will still miss out on a cash prize. The very best thing about this slot tournament is that there are no wagering requirements linked to the cash prizes so if you win, you win and the money will be yours!